Glenfarclas Movember 2011 Redistilled (53.0%): So, this sample is a part of the geeky experiment Master Of Malt folks did last year. They basically re-distilled five Scotch whiskies, created a small batch and sent the samples to whisky bloggers to start a discussion. I wasn't lucky enough to get the batch but followed the buzz online. A few weeks ago Gal from Whisky Israel sent me one of the wee samples so I can have a taste of it as well. I wish I had the original Glenfarclas Movember 2011 to compare it with but at least I know that it was a nine year old whisky matured in two different Oloroso sherry hogsheads. Color: Duh... Clear... Nose: Candle wax, Granny Smith apples and fresh green figs. The spirit noses like rye vodka or malt jenever and a few drops of water made it even more so. Now it noses like a piney gin. I believe it wouldn't be unfair to say that not so much stuff going on here. Palate: Surprisingly creamy and thick mouthfeel. Actually very drinkable at this abv. Herbal and malty: juniper berries, pine nuts, rosemary and oregano. Water amplifies the herbal notes. Finish: Short(ish) to medium long with sizzling white pepper and dried malt. Overall: Like I said it would be very cool to have the original Movember because now I wonder if you could detect all these gin notes in it as well. I am curious if these notes are added somehow during the re-distillation or they were hidden and are exposed now after the whisky is stripped. I think "stripped" is the right verb here. It doesn't taste like a new spirit, it has definitely more character and depth but you are also clearly aware that you are missing some stuff... It is so obvious that the whisky is peeled off naked. Pretty unique experience I have to say. By the way I nosed the empty glass again after a minute: Nothing! All gone into the thin air... Nosing like the water glass. Odd... Thanks again to Gal for the sample. 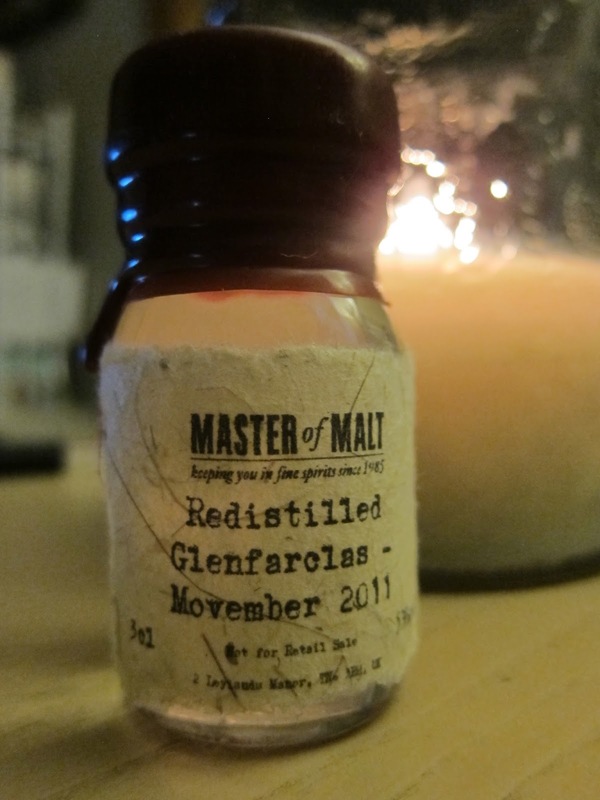 Click here for the review of the original Movember 2011 from The Malt Impostor.